47! 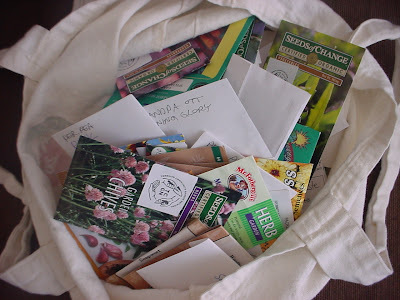 packages of seeds - where in the world am I going to plant all this, never mind starting the ones that need it indoors? Well, I can always share...friends beware, strange packages of seeds coming your way! There was good food, interesting people, and an "eco-fair" with cool booths like composting worms and solar ovens and lots and lots of seeds. The workshops and films sounded interesting, but I had a limited amount of Free Mama (shouldn't that be a movie?) Time. This is a dear aunt's Christmas present from a Christmas past (I'm not telling how past). 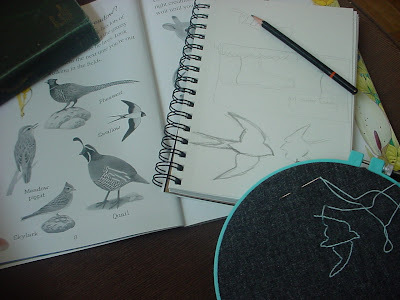 Having no tracing paper, no fabric pencil, but really really wanting to embroider a swallow on it (they have barn swallows in their backyard), I tried to free-hand stitch it after drawing the outline from a book of Safiya's...it's not done, but I can already tell my swallow looks like he hasn't eaten in a while...it's an emaciated swallow...sigh, well, it looks swallow-ish! (I like it enough to resist pulling out the stitches - I hate pulling out stitches.) I'll post the finished product tomorrow. Not to drag all the details out, but Mr. S. and I have a kind of "attachment parenting" thing going on, which has included carrying Safiya in a sling, co-sleeping, and breastfeeding on demand. It's been lovely, perfect for us (including the ups and downs and what-in-the-world-are-we-doing? - that's part of it), and we've never regretted our decision for a second. And it's resulted in me nursing a toddler, which very often results in general hilarity. For the past week before bed Safiya has been saying that she doesn't want to go upstairs and doesn't want "Mama milk". To quote: "I don't want to go upstairs, I want to stay downstairs. I don't want Mama milk!" Chalking it up to staying-up-too-late-delirium and seemingly general toddler indecision, we've been ignoring her, taking her up to bed, and she ends up nursing to sleep like she always does. But she wasn't very happy before bed and it was taking a long time to go to sleep. 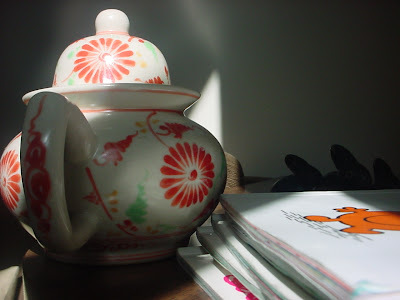 I happened upon two articles by Sandra Dodd, one on sleeping and the other on meals. We've been toying with the idea of eventually unschooling, so the ideas, which are based on a fundamental respect for children and a trust that they can figure things out, weren't too far of a stretch, but still....trust your two-and-a-half-year-old? Yikes. Today she nursed only when she woke up from her nap, for a little bit. Today for the first time ever she went to sleep (for both her nap and at bedtime) without nursing. And she was happy. I'd cry a little bit, or rather I did when it happened to me. When Freddy stopped nursing (25 months?) it was pretty hard for a while. I did find comfort in Finny, however, growing nicely inside me, keeping warm with mama love. Fast forward two years and Fred may not be nursing but she is still co-sleeping and only beginning to toy with the idea of sleeping on her own. It is hard, but it is beautiful too.